Standing at a mere 5-foot-3, 22-year-old Rachel Larsen is packed with passion and — surprisingly — one of the biggest voices you’ve ever heard. 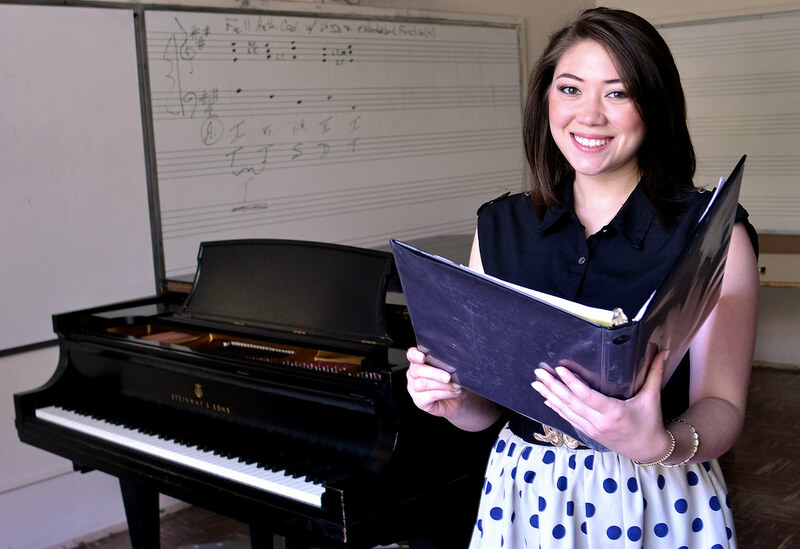 As a graduating senior this May, pursuing a degree in vocal performance, Larsen performed her senior recital March 8, which is a final project requirement for all performance music majors. While most students use easily accessible music for their performances, Larsen had a tough time finding her music of choice. “I’m half Filipino, so I feel very involved with my culture and my heritage, and I thought it would really be great to be able to involve a piece of Filipino culture in my senior recital. So, I Googled it and woah, there was a whole bunch of stuff — except I couldn’t find any music,” said Larsen. With close personal and familial ties to the music, Larsen was determined to get her hands on as much Kundiman as possible. Kundiman, also known as Filipino art song, is a genre of traditional Filipino love songs that is rare to come by in the United States. After almost two years of extensive searching on Internet archives and asking multiple friends and family members, Larsen finally found eight pieces of Kundiman, fulfilling her need to collect as much of the music as possible. One of Larsen’s teachers, Alexandra Sessler, was there to help Larsen during her musical journey through Filipino art song. “I got to learn a lot about singing in a language I was completely unfamiliar with, and Rachel got to learn how to fit that language into techniques we’d already been working on,” Sessler said. A famous Filipina soprano in her day, Larsen’s Lola Chuling tragically passed away at age 38. Though Larsen was never able to meet her, she was always told that she inherited her famous voice. “Ever since I started taking lessons, I always hear family members tell me, ‘Oh, you got your voice from your Lola Chuling. You’re doing such a good thing. This is making her proud and making all of us proud.’ So I really wanted to find music to sing for my family and to dedicate it to her memory,” said Larsen. Larsen’s passion was very apparent through these songs, as noticed by her accompanist, Osvaldo de Leon Davila. “She had such passion for these songs; it was almost as if by singing them she exposes her pride of who she is and where she comes from. She is a great musician and singer, but everytime she would sing these particular songs she became vulnerable, transparent, exposed, pure, full of love, and in a word, she embodied beauty,” said de Leon Davila. Along with her family, Larsen also finds support in her peers. “It was a great pleasure to work with her, she is musical, expressive and an extremely hard worker and has the good fortune to have a beautiful voice. I was honored and excited to be trusted with the responsibility of being her pianist,” said de Leon Davila. “Rachel is dedicated to bringing to light repertoire that is underrepresented — such as Filipino art song, and especially music of women composers. It’s been a joy to be her teacher and to be a part of that. I am completely on board with this mission of hers,” said Sessler. Larsen and Sessler plan to team up in planning events and recitals in the near future to shed more light on female composers, which is another of Larsen’s musical passions. “As a musician, a big part of it is just to have fun because of the music and singing and everything like that, but another really huge part of it is that this music is history and this music means something to very many people. I feel so proud to have it, and I feel so proud to be able to give it to my family,” said Larsen.